A dazzling spectrum of color, this vibrant bouquet brings party flair to any special occasion. Fresh-cut flowers such as carnations, Gerbera daisies, spray roses, alstroemeria, and more are festively combined in a clear glass vase. 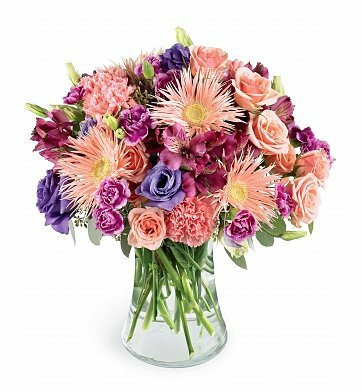 Flush with eye-catching shades of fuchsia, peach, and violet, this abundant mix of flowers always sends a joyous message. Carnations, Assorted Lush Greenery and more. Festival of Color Bouquet is a hand delivered gift. These gifts are delivered by one of our local design centers located throughout the United States and Canada. Same day delivery is available for most gifts when ordered before the cutoff time. The cutoff time for Festival of Color Bouquet is 2 PM in the recipient's time zone. Sent these flowers to my sister for her birthday. She said they were beautiful and very fragrant.